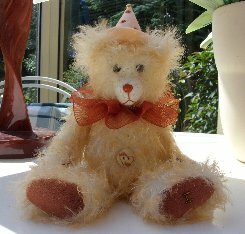 Let us introduce you to Withiel, a lovely 8" Clown made of cream backed, soft, whispy, curly, peach tipped German mohair. This fur is really gorgeous, think of the texture of candyfloss without the stickiness and you'll be on the right lines! We have given him dark terracotta cashmere pads and paws, a peach felt hat with toning stars stitched on it and a small brass bell on the top, a terracotta stitched nose and shiny black German glass eyes. Withiel, who is part of our Cornwall Collection, is filled with steel shot, glass bead and steel balls so he has some weight but is still soft and cuddly. He has a lovely chiffon ribbon ruff and a very pretty hand painted wooden belly button with a heart on it. I do hope that you like him, he is rather lovely. Withiel costs £67.75 plus postage. This may seem like an odd price, but it has been adjusted slightly for the postage charge, as Withiel is too tall to be sent as a small parcel and is classed as a medium one. Please note that as with all our bears, Withiel is not a toy and is not suitable for children. Sorry - Withiel has been adopted.